Another day, another release of a new Solo: A Star Wars Story video. I’m the first to admit surprise here, but the more I’m seeing of the Solo solo film, the more I’m thinking it’s not going to be the letdown we think it is. 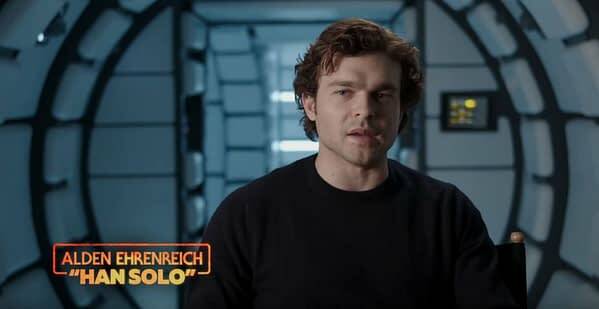 “It’s all part of the expansion of the Han Solo world,” Alden says in the video. “It’s a right of passage, the tests we face, the challenges he has to endure, to become Han Solo,” Howard says. There is actually a ton of new footage in this featurette; new scenes, new characters. I would go so far as to surmise this snippet of a featurette may appear on a future release of the Star Wars standalone film when it hits DVD/Blu-Ray. Which in a way is why so often, the big studios are scrimping on their BTS offerings, because they release so much of it for early promotional reasons rather than waiting to compile. That doesn’t mean it’s a bad move, just, disappointing when the feature’s home release has nothing new. Solo: A Star Wars Story is set to hyperspace jump into theaters next month on May 25th 2018.